Friday night I was at Giant Eagle Market District. Saturday morning I was at Bethel Bakery. 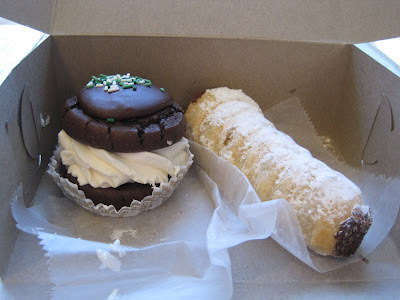 There is no way I can visit either place and leave without bakery goodies. First up, Market District. 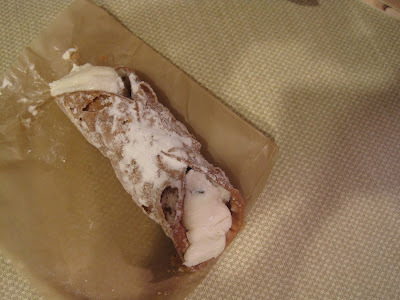 We picked up some chocolate thumbprints and a couple of these: Cannoli. I love cannoli. 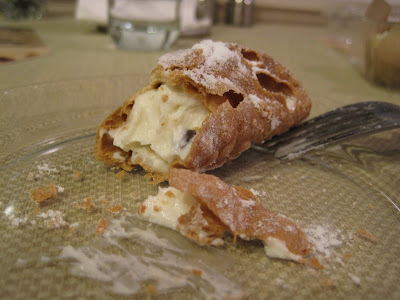 It's tough, in my opinion, to find a truly delicious cannoli. But these are pretty darn good. They were $1.50/each, which doesn't seem too bad. The shell was crisp and despite purchasing them around 8 pm and eating them around 9:30 pm, the shell was not soggy from the filling. The filling was smooth and creamy and tasty. 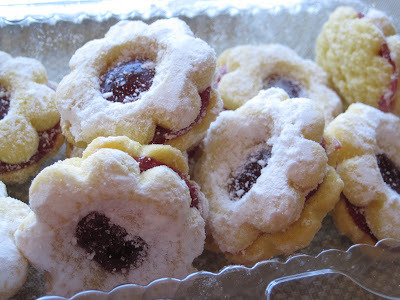 I'd get these again as a treat. 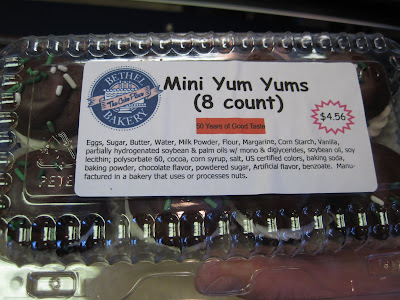 Next up, Bethel Bakery treats. 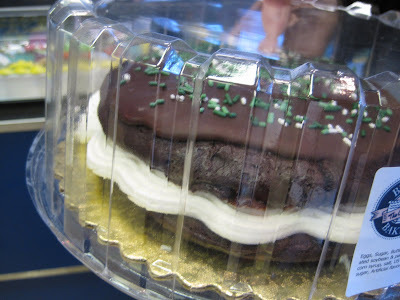 Of course I got a Yum Yum, decorated with St. Patrick's Day green sprinkles. 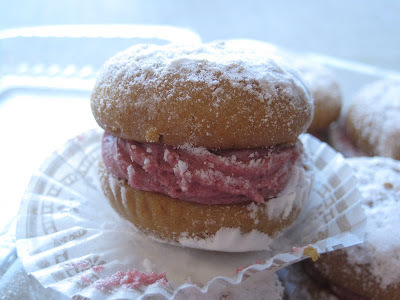 I also couldn't resist a chocolate buttercream filled Lady Lox (you can't tell it's filled with chocolate cream in the photo): SP was enticed by these cuties, raspberry filled tea cookies: We ate a couple of them in the car while we were doing errands Saturday afternoon. They are so small and bite-sized -- it would have been very easy for us to eat all of these in one afternoon. Delicious. The only problem: we managed to drip powdered sugar all over our coats while eating and sitting in the usual Robinson traffic gridlock. 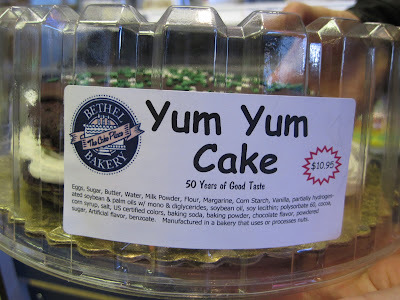 I also made a discovery: there is more than one size of Yum Yum at Bethel Bakery. I heard SP say,"Oh no" and I turned around and he said,"Did you see it?" and he laughed and pointed at a GIANT Yum Yum: Which looks like this: And there are incredibly cute mini Yum Yums: And the incredibly cute mini Yum Yums also come as almond cookies with raspberry cream filling flavor: It is entirely possible that we left Bethel Bakery with some of the almond/raspberry mini Yum Yums. And that they aren't lasting long. Although I was really, really tempted, I resisted the GIANT Yum Yum Cake. It's going to be a good dessert week!!! I feel so behind on all of the blogs! The treats look lovely! I think I am going to order my sisters shower cake from Bethel Bakery! Any suggestions?? Hope all is well with you and Greg! Whitney: We have actually fallen in love with their almond cake with raspberry cream between the layers - like the new Yum Yums. The chocolate mousse filling is very good, too - a chocolate cake with that filling would be good! I don't think you can go wrong with Bethel Bakery! !